By and large; the digital divide refers to inequality in access to, or ability to use, information and communication technologies. Such a divide may exist between populations and geographic areas in a given country or between countries. The global digital divide, often refers to the fact that the internet has not spread evenly throughout the world. 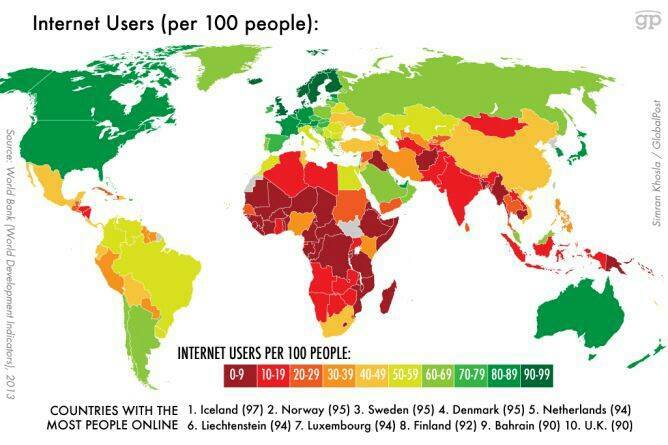 Such is the case with Africa which is the world’s region with the lowest internet penetration rate. While some African countries have narrowed this gap in recent years, such as Kenya that has an internet penetration rate (% of population) of 47.3%, other African countries still lag behind the rest of the world. Such is the case with the Ivory Coast (4.2% penetration), Eritrea (5.9%), Ethiopia (1.9%), Rwanda (9.0%). As a whole, Africa has a penetration rate of 26.5% as opposed to Europe’s 70.5% and 87.7% in North America. However, there seems to be one area in which the digital divide between Africa and the world in narrowing, that of digital diplomacy. Last week I explored this narrowing digital divide by focusing on the social media activity of African MFAs. This week I explored it through network analysis. 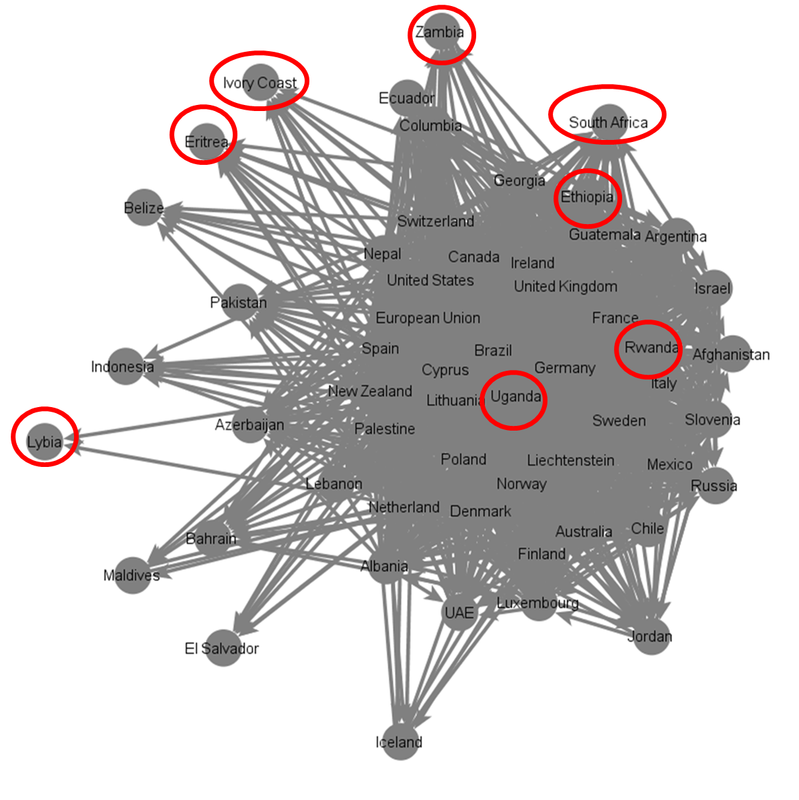 I first analyzed the Social Network of Mission to the UN in New York. The UN is the world’s most important hub of diplomacy and as is the case with African MFAs, African mission to the UN are also very active on digital diplomacy channels. Even more important is the location of African missions in the UN Social Network. Using a sample of 57 missions to the UN, and the Visone program, I mapped the UN Social Network on Twitter. 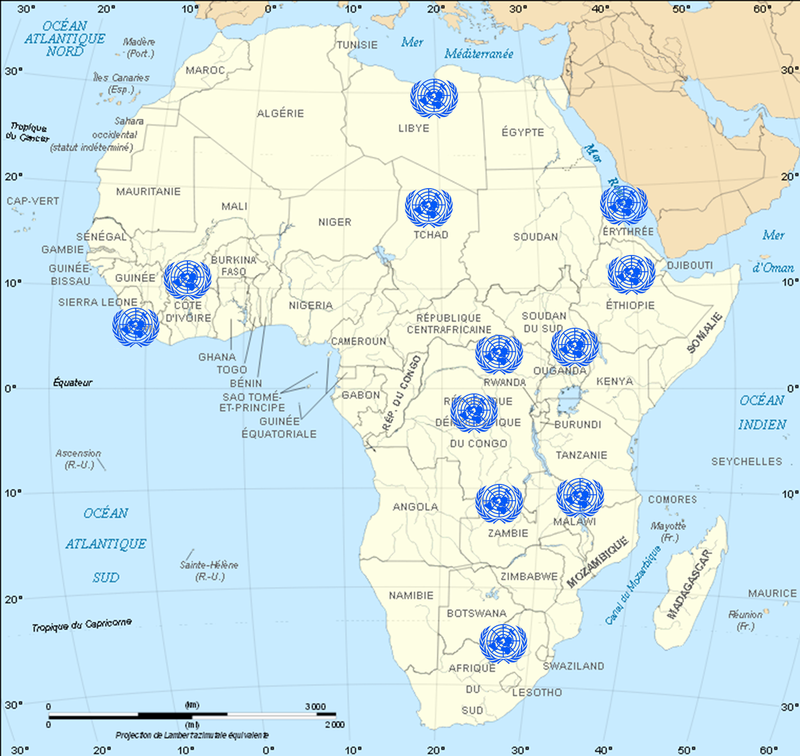 The image below exhibits the location of the following African mission in the UN Social Network:Libya, Ethiopia, Eritrea, Zambia, Rwanda, Uganda, Ivory Coast and S. Africa. In order to analyze this social network I calculated three parameters. The first is the in-degree parameter which measures the popularity of the missions comprising the network. The more popular a mission- the greater its ability to disseminate information to the UN diplomatic community. The second parameter was the out-degree parameter. This indicates which missions are the most avid followers of their peers and are thus able to gather important information from the network. The third parameter is the betweenness parameter that identifies which missions serve as important hubs of information as they connect UN missions that do not follow one another directly. The scores calculated of each African UN mission is presented in the table below. As can be seen, Rwanda is one of the ten most popular missions in the entire UN social network coming ahead of Western countries such as New Zealand, Spain, Poland and Russia. Rwanda’s mission also has a relatively high betweenness score (23 of out of 57) indicating that it serves as an information hub for other missions. In fact, Rwanda has a higher betweenness score than the Italian, Chilean, Mexican and Russian missions to the UN. Uganda also scored high in the in-degree parameter (22 out of 57) and it attracts more of its UN peers than the Russian, Swiss, Irish and Israeli missions to the UN. 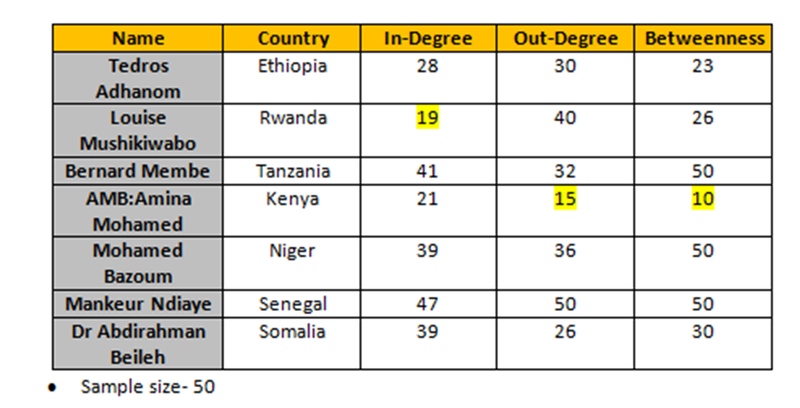 Uganda also scores very high on the out-degree parameter (13 out of 57) indicating that it is not only popular but is also an avid follower of other missions to the UN. Finally, Uganda’s betweenness score is also high (20 out of 57) and it is a more influential information hub than Canada, Israel, Brazil and Argentina. Other African missions aren’t as central as Uganda or Rwanda. Eritrea, the Ivory Coast and Zambia received very low scores on all three parameters. Ethiopia, on the other hand, has a relatively high out-degree score and S. Africa has an average in-degree score. In summary, the analysis of the UN Social Network suggests that African nations can use digital diplomacy in order to position themselves at the very heart of international diplomacy. They may, however, face an uphill battle. In addition to the UN Social Network, I also evaluated the Social Network of Foreign Ministers on Twitter using a sample of ministers from 50 countries. The Social Network of Foreign Ministers on Twitter, and the location of African Ministers in this network, can be viewed in the image below. 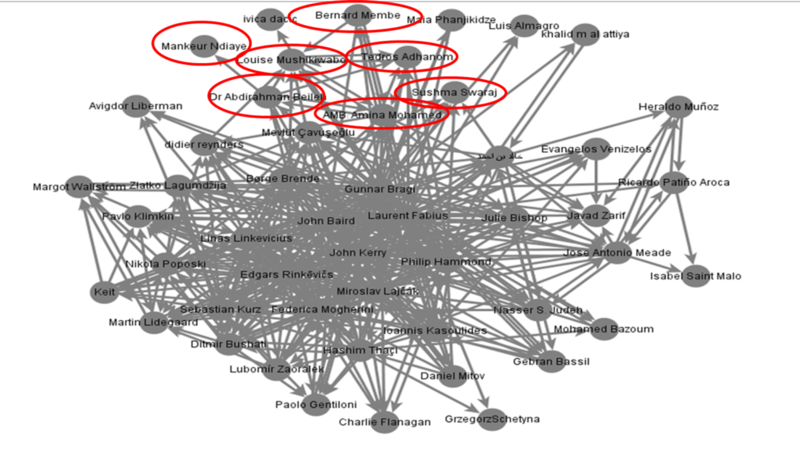 Analyzing the centrality of African Foreign Ministers in this network was accomplished by calculating the same three parameters mentioned above. The results of this analysis are presented in the table below. In this social network, Kenya’s Foreign Minister rules supreme. Ambassador Mohamed received a relatively high in-degree score (21 out of 50) demonstrating that she is more popular among her peers than the Italian, Irish or Swedish foreign minister. Her out-degree score is also high (15 out of 50) indicating that she is one of the most avid followers of her peers in this network coming ahead of ministers from Mexico, Estonia, India and Israel. But most important is the fact that she received the 10th highest betweenness score of all ministers demonstrating that she is one of the most influential information hubs in this network. Rwanda’s foreign minister also received a relatively high in-degree score (19 out of 50) and he attract more peers than ministers from Belgium, Israel, Italy and Ireland. His betweenness score indicates that he is a more influential information hub then FMs from Estonia, Belgium, Chile, India and Iran. Finally, Ethiopia’s foreign minister received the second highest Betweenness score of African foreign ministers and place in the top 30 on all three parameters. It is quite obvious that in today’s world, where the competition among the countries is growing rapidly, the tiny countries receive less attention and a sort of limited space. In light of this, for a small country with limited odds, such as Kosovo, the most effective means to mark our presence worldwide and to strengthening our nation branding is digital diplomacy. That’s one side of the coin. The other side was to use social media tools in order to get your message across; to be much more present. As a matter of fact, the online presence sometimes matters as much as the physical presence, maybe even more. Technology gives us tools available to enhance traditional diplomacy, to make it easier, make it more affordable, and be more efficient and effective. Posted in Uncategorized and tagged Africa, Digital Diplomacy, foreign ministers, Kenya, Social media, social network analysis, Twitter, Uganda, UN. Bookmark the permalink.